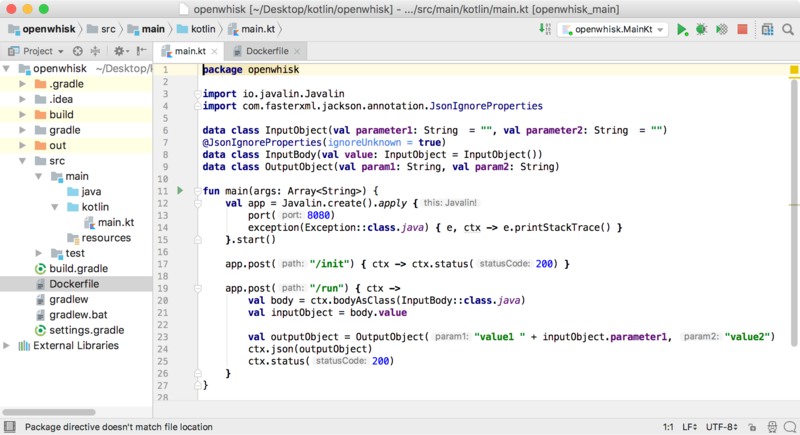 I’ve implemented some code that shows how Apache OpenWhisk functions can be developed with Kotlin. The Java code is built via Gradle and put into a Docker image which can be deployed to OpenWhisk cloud providers like the IBM Cloud. There are different approaches to write OpenWhisk functions with Kotlin. Check out this separate article which describes how to generate a jar file which is directly deployed on OpenWhisk. The approach taken in my sample is slightly different. Rather than deploying a jar file to the OpenWhisk Java runtime, a Docker image that contains the jar file is used instead. The advantage of this approach is that it allows to use different Java versions and you can develop and test the same Docker image locally which is later deployed and run in the cloud. This minimizes the chances to run into issues because of different environments. The sample function can be invoked locally via this command. As web framework I’ve picked Javalin and I’ve implemented two endpoints ‘/init’ and ‘/run’. The actual implementation of the function goes in the run function. The inputs and the outputs of the function are defined in data classes at the top. The mapping between classes and JSON data is done automatically by Kotlin/Jackson. I like that the code has only 27 lines. The same function that I developed with Java has more than 100 lines of code. If you want to try out OpenWhisk in the cloud, you can get an account on the IBM Cloud.